Do you love solitaire-style mobile games? If the answer is yes you’re in luck because Miracle Merchant ($1.99) released today and is one of the best card games in the App Store. 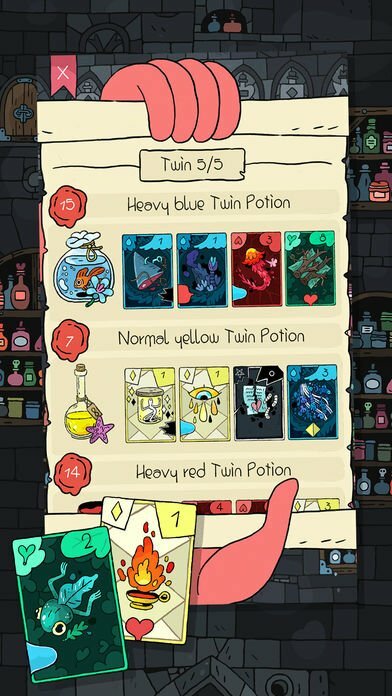 Miracle Merchant is the latest title from TinyTouchTales, indie developer and master of modern solitaire variants. 2015’s Card Crawl ($4.99) is on my Mount Olympus of mobile games and has been the source of countless hours (seriously, I couldn’t begin to count them) of entertainment. Card Thief ($2.99) was released earlier this year and is also eminently replayable. Miracle Merchant has you don the apron of a alchemist and shop keep in a vaguely medieval setting. A steady stream of customers await you, each seeking a potion brewed to order. 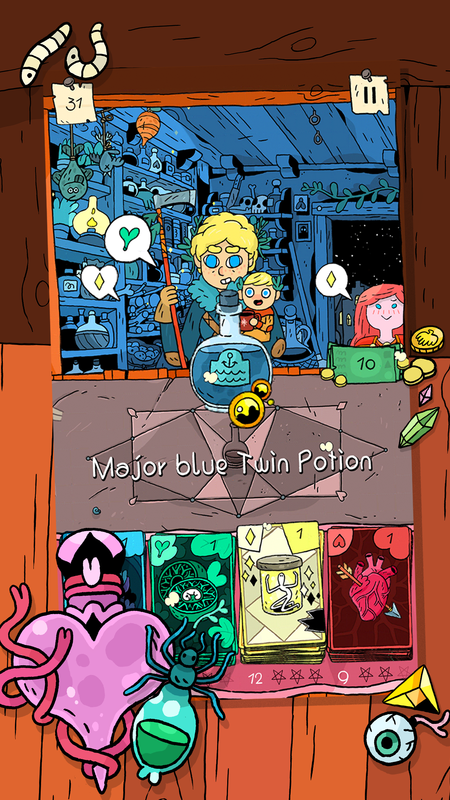 You brew potions using cards in four different colors—blue, green, yellow, and red—each representing a different ingredient. The ingredients stacked in four different decks of 13 cards each. Each customer has an ingredient that must be in their potion, and an ingredient they prefer to be included, but won’t write a nasty review on ye old Yelp if it’s not there. A potion consists of four ingredient cards which you drag and drop into a beaker. You earn gold based on the quality of your potion and the extent to which it satisfies the customer. Customers dig recipes, which are combos like rainbows (using one of every color), twins (two of a kind), triplets (three of a kind), and duplexes (two pair). You get bonus gold for sneaking in the customer’s preference ingredient as well as for the placement of ingredients—certain cards provide a bonus for being placed next to a particular color. There are also a number of tasks, stuff like “create 3 duplex recipes" and when you complete those you can really cash in. Miracle Merchant is a high-score chaser and your goal is to run up that score while using all 52 ingredient cards. If any potion you brew fails to earn gold or doesn’t include the customer’s required ingredient, you lose the game. It’s not as easy as pie, however. Refrigeration is a problem in the potion business, and unfortunately ingredients often end up spoiled. These spoiled ingredients, represented by black cards, are sprinkled throughout the four different decks and have a value of -1 to -3 which brings down the quality of any potion in which they are included. The trick is to slip them into potions where you can minimize their effect, such as alongside ingredients that gain a bonus for being next to a black card or in potions for those occasional customers who like spoilage—hey, different strokes and all that. Miracle Merchant is quick and easy to play one-handed, which makes it perfect for those short gaming sessions while out and about. It’s also a great deal of fun and just the right level of challenge to engage but not frustrate. The art is also worth mentioning, the various characters and chemical concoctions are bright and attractive and add to the enjoyment of the game. If you’re a fan of card games on your iPhone I strongly recommend picking this one up, and joining in the discussion in our forums.